What do the numbers mean at the bottom of plastic containers/trays? These are the symbols on plastic containers which identify what type of plastic the product is made from. 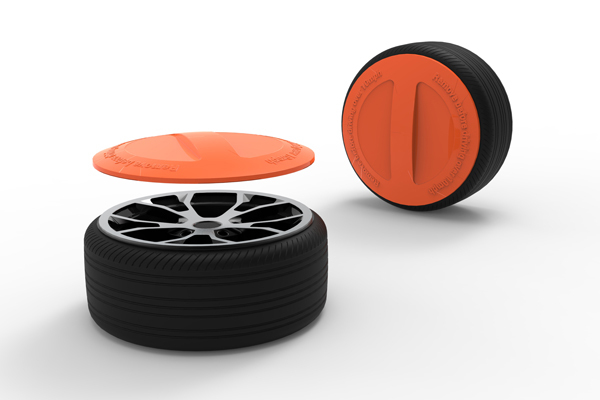 Charpak publish the plastic resin list on our website for the products that Charpak manufactures: https://www.charpak.uk/materials/. The plastic resin codes are Worldwide codes, and are mandatory throughout Europe. What do the different recycle labels on packaging mean? Are you doing anything to prevent overpackaging? 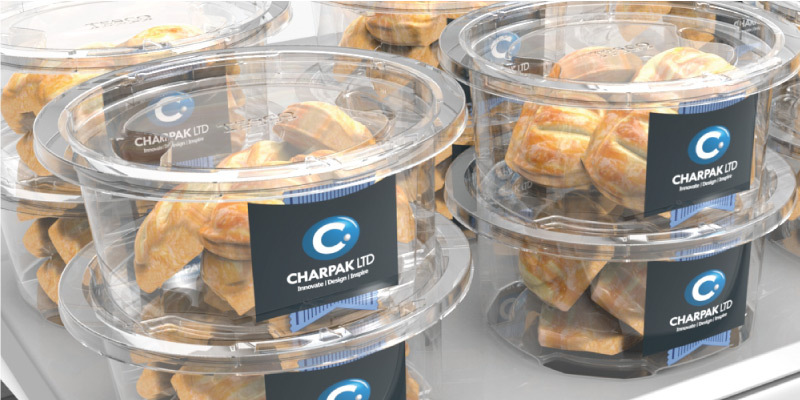 Charpak start the design process with packaging minimisation in mind and encourage all our customers to reduce the amount of packaging they require. The company ethos is to reduce, reuse and recycle all packaging materials. How much of Charpak packaging comes from recyclable sources / is recyclable? 99.8% of our packaging contains Food Grade Recycled Plastics. Everything Charpak produce is recyclable. Yes – The energy costs to recycle plastics are lower than recycling glass, cardboard, aluminium & steel www.bpf.co.uk. Using recycled plastic materials uses lower energy costs than making Virgin Grade materials. What’s the difference between Bio-plastics and Biodegradable plastics? Bio-plastics are a form of PET that has the fossil fuel element replaced by a plant-based alternative. Bio-degradable plastics are plant-based alternatives that degrade in the earth using either water and heat or are water soluble. Why don’t we use more compostable biodegradable plastics? Unfortunately, the UK does not have an infrastructure system to deal with biodegradable plastics. 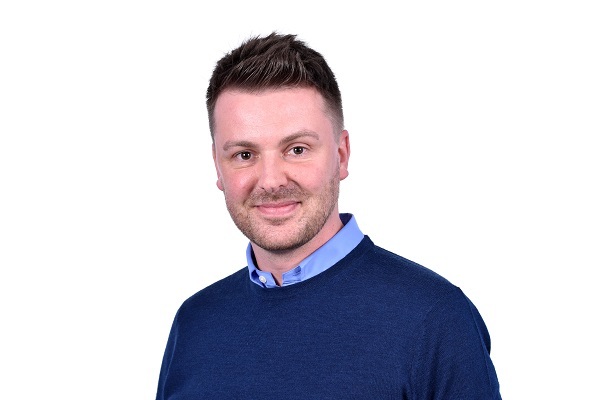 If the UK manufacturers were to manufacture using bio-degradable plastics now, there is a substantial risk that the biodegradable plastics would contaminate the existing plastics and cause even more environmental damage. Charpak can readily switch to bio-degradable plastics as soon as there is a waste and recycling system to deal with it. Why are different types of plastic used? Sometimes it is necessary to use different types of plastic because of the product going into them. For example, if the food needs to be re-heated in a microwave you will need to use either PP (Polypropylene) or CPET (Crystaline PET) which make these plastics suitable for heating. Are your plastics Compostable, Recyclable, Bio-Degradable or Sustainable? Our products are recyclable. Which helps to make them sustainable. Which plastic is the least damaging to the environment? Any plastic that is recycled is less damaging for the environment. All plastics can cause damage to the environment if misused. However, mining for Aluminium or Steel or for Glass (Silica) causes damage to our environment. This is why Charpak advocates more recycling of all these products so we cause less and less damage. Charpak does however advocate FSC for Cardboard and Carton Board as this means more trees are planted than are chopped down. FSC approved boards are made with, or contain wood from FSC certified forests, or from post-consumer waste. As consumers, we would all have to change the way we live our lives and change our lifestyles reverting to shopping for fresh food on the day we want to eat it. This would mean there is a great possibility that food prices would increase. Surely the UK should be using recycled board in packaging rather than plastic? Recycling Plastic is around a third of the cost of recycling Cardboard and it uses far less water. Are the plastics that we find in the supermarket completely made from recycled material? Plastic packaging used for food is generally in PET, CPET, HDPE (milk bottles) or PP they are used for a multitude of reasons including Protection, food safety, lightness of packaging, customer convenience and for cost reasons. Most products that are on the shelves in PET packaging have a recycled content. This can be as low as 30% and as high as 75%. Charpak are advocates of taking these figures to a 90% recycled content. However, we need to educate society to make sure plastics are recycled through their kerbside collection rather than just thrown away to enter our oceans. Does plastic reduce food waste? Yes, and this is widely recognised in the food and beverage industry. As a durable material, plastic packaging enables products to be transported from multiple countries and regions to others. Why isn’t food packaging in cardboard instead of plastic? Cardboard containers for food that contain moisture need to have a laminate applied to stop the cardboard getting soggy and falling apart. This makes the cardboard non-recyclable without specialist facilities to separate the 2 elements. Unfortunately, we do not have enough of these facilities available in the UK to cope with the volume of cardboard containers. For example, the sandwich packs in every supermarket that we assume are recycled currently go to landfill because the UK cannot recycle them efficiently nor cost effectively. Is all paper and cardboard recyclable? No, it is also environmentally damaging to recycle Cardboard because it uses a lot of water and a lot of electricity to recycle. It also heavy so it costs a lot to transport which has an impact on the amount of lorries on our roads. What can I do as a consumer to better ensure that my plastic is re-used? Ensure all the plastics that are currently recycled by your council are placed in the correct bin. What is the easiest way to find out if my recycling is actually recycled? Most councils publish a list of what they collect on their website or in council offices. More than 90% of councils collect clear plastics. If you need more detail of UK data, please refer to the RECOUP report “2017 UK Household Plastics Collection Survey”. How much of my plastic waste is recycled? Due to the nature of the UK’s waste collection this varies by local authority. Currently, the best recycling performance is Wales where 65% is collected for recycling. In England the figure is a 45% collection rate. The UK’s Waste Framework Directive target is to achieve 50% of household waste recycling by 2020. Scotland has a 70% recycling target with a minimum of 5% to landfill, by 2025. Why is so much plastic packaging ending up in the sea? This is a societal issue. Littering is an increasing problem in modern day society. The litter seen on the beaches and in the oceans has been left by people, visitors to beaches and inconsiderate throw-away disposal into the environment. The best way to ensure plastic (and other discarded) containers do not reach the sea is to take litter home and reuse or recycle it. As a nation the UK needs to recycle all packaging within the UK rather than shipping it around the world for recycling or incineration. Developed countries need to support developing countries in creating the correct infrastructure to deal with their waste. More plastic packaging ends up in the oceans from countries in Sub-Saharan Africa, India and East Asia than from the UK. Without help from the West this will continue to be a problem. 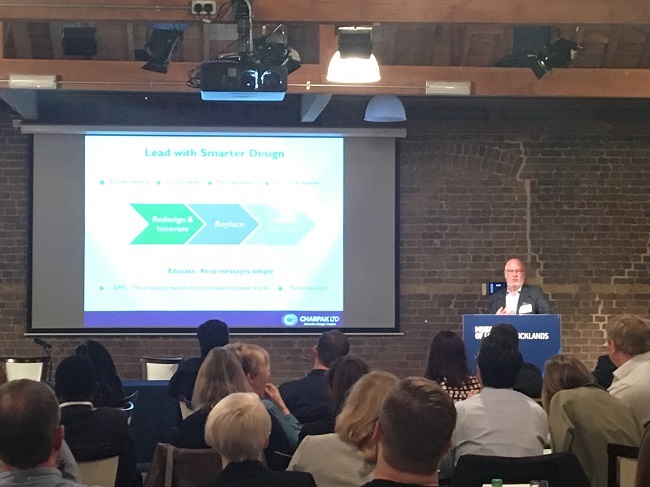 Charpak are working with organisations which are looking to build a framework that is scalable across countries and continents. How do I know what plastic is recyclable when there is no symbol on it? Charpak advocates that there is a single waste collection scheme for the whole of the UK, however until that exists we recommend checking LA website for which Plastics they currently collect. The easiest solution to this is to put all plastic containers in the recycling bin and allow your council to sort the plastic. Are all colours of plastic recyclable? Yes – coloured plastics are recycled and re-processed to manufacture black plastic. This is why there is a need to continue using black plastic otherwise there is potential for an even bigger issue to be created. By creating a pile of coloured plastics that have no way of reuse or recycled. Why do Charpak use Black rPET when it is not recyclable? Black Plastics are recyclable. Unfortunately we do not currently have enough facilities to do this in the UK. Charpak are working hard with our partners and lobbying the government to do more of this. As part of the UK Plastics Pact there is a system currently being set up to do this. Why are plastics packaged in black plastic? This can be for a number of reasons. Sometimes it is necessary to protect the product inside from light (UV) and black stops light getting through. Sometimes it is also for cost reasons – Black material is cheaper. Other times black plastics is selected because it makes the product stand out. What is multi-layer plastic? What are flexible plastics and why are they used? Multi-layer plastic is normally a film (Flexible) used as a barrier to prevent air passing through to the food and spoiling it, other films allow some gases to escape and allow others to pass through. This is all for food safety reasons. The plastics industry is working hard on alternatives to flexible plastics as they are not readily recyclable. A composite material is one that is made from a combination of different types of material (i.e. mixed together) these should be avoided as they are harder to be recycled. Charpak does not produce anything from composite materials. Why is microwaveable food in non-recycled plastics? Is cardboard better? Both PP and CPET are used for microwaveable foods. They are both recyclable, unfortunately we do not recycle enough of these in the UK. Charpak are lobbying hard alongside our partners to ensure more and more plastics get recycled. Cardboard food containers currently must have laminate applied to stop the food making the cardboard soggy. These types of laminated cardboard food containers are not currently recycled in the UK and end up in landfill. 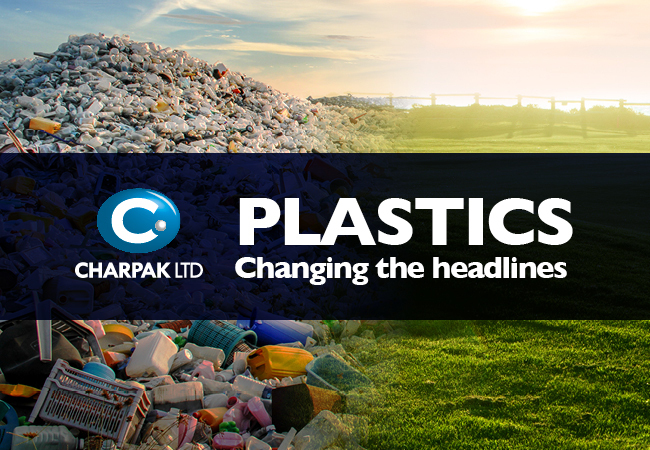 Charpak believes we should have a proper recycling facility to deal the plastics versions as these are easier to recycle and are less damaging to the environment when recycled. What is food grade recycled plastic? This is a term used for plastic that has been through a process known as “Super-clean”. It is a certified process that takes the discarded bottles and containers that enter the recycling facility and sterilises it to make sure it is fit to come into contact with food. Virgin plastic is a term for plastic that contains no recycled material. Do all products you supply have the same recycling symbol? No. Plastics are made from different polymers, and have different technical properties. The plastic resin identification codes are numbered 1-7. Plastics materials have different codes. Please visit the Materials section on our website for the codes Charpak use for the materials we produce. Can plastic get recycled into something new or a different product? Yes – a lot of Charpak’s recyclate comes from plastic bottles so what was once a bottle may well be the packaging that consumers buy their cakes, or biscuits in. PET can also be made into clothes, utensils, furniture and a host of other products. As a 100% recycled product, to keep the same properties it is around six times. However, if you maintain 10% and up to 25% virgin content the plastic can be recycled an infinite number of times. This means as a nation we could save 90% of future production if we consistently recycled current plastics with the associated Fossil Fuel/Chemical savings, which is a massive benefit for the environment. Why can some plastics be recycled and others not? All plastics are technically recyclable. Unfortunately the UK does not have the infrastructure to recycle all plastics. Charpak belongs to Recoup (www.recoup.org.uk) supporting the investment and programme, to lobby the Government to expand and embrace recycling more in the UK. What is the cheapest type of plastic to recycle? Any type of plastic that is a single substrate is easy to recycle (this includes PET, PP and HIPS). The more complex materials to recycle are where a multi-layer packaging material is used. Charpak recommend avoiding multi-layer packaging, and do not manufacture any multi-layer packaging. What would happen if supermarkets stopped using plastic? This would cause major changes to our lifestyles as the shelf life of a lot of products would have to change. This would potentially mean a huge increase in food waste (already running at a £15 billion cost per annum (Source: www.wrap.org.uk) which is far more damaging to the environment because of the attendant methane emissions (greenhouse Gas). This is without considering the cost of producing the food in the first place (water, fertiliser, labour, transport, packaging etc.) Ultimately this would inevitably lead to higher food costs for every consumer. What plastic is primarily used in food packaging? Why? Plastic packaging used for food is generally PET, CPET, HDPE (milk bottles) or PP (polypropylene). These materials are used for a multitude of reasons. This includes protecting the product in transit, hygiene and food safety by preventing contamination and harmful bacteria. Plastic packaging is lightweight by comparison to other materials, so it is lighter to transport for customers and businesses. Plastic packaging is used for customer convenience and for cost reasons as a lower cost material than others. Does rPET compromise the quality of the product? The properties of rPET are the same as a Virgin PET. However sometimes there are subtle variations in the clarity of the product due to the addition of recycled materials. How can PET be a positive for the environment if it is made from petroleum based raw materials? rPET is positive for the environment because it reduces the amount of Virgin grade plastics used and saves fossil fuel production. Charpak is an advocate for greater quantities of recycled product going into production for precisely this reason. Is there a way to find out what source the plastic came from? Most plastics are derived from fossil fuels. There are plastics available that have the fossil fuel element replaced by a plant-based alternative. These types of plastics are recyclable back into any matching type of plastic. What is the difference between Acetate and Thermoplastic or are they the same? Acetate is a generic term for a plastic container. Thermoplastic just means a substance that goes plastic when heated and hardens on cooling. Do Charpak plastic products contain Bisphenol A (BPA), Triclosan or Melamine? No. Charpak products do not contain BPA. This is used as a softening agent and is not needed in our process. We do not supply products with Triclosan in. This is used as an anti-bacterial agent so may be in some plastics (chopping boards etc). Triclosan is also used as a colourant in white products (e.g. some paints). No Charpak products contain Melamine. Melamine is a trade name for a type of plastic most commonly used on table tops and works surface etc. If infrastructure is one of the main barriers to recycling, what is Charpak doing to help? Charpak speaks directly to retailers, waste collectors and processors along with their customers about recycling more and making products easier to recycle. It also belongs to bodies such as WRAP and Recoup who we work hard with to lobby government to invest more in recycling in the UK. How are you encouraging recycling? Charpak recommends marking all products with the correct recycling logo, based on approval by the client. 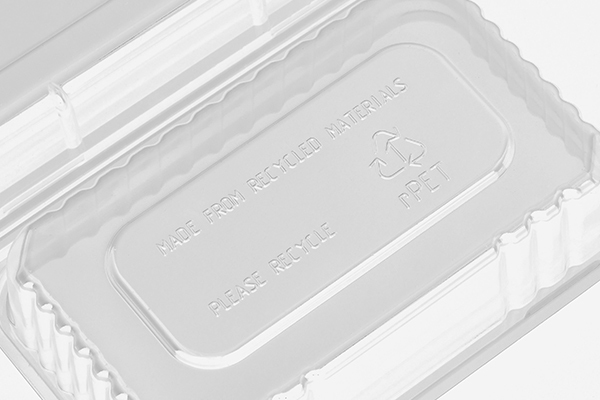 Where permissible, and not impacting on the clients’ design requirements a “please place in your recycle bin” message is also thermoformed onto the packaging. Charpak’s Designers, Technical and Quality Department actively recommend recycled and recyclable plastics wherever possible, and functional requirements of the products allow. With a clear environmental policy, and only 0.2% of Charpak’s waste going to landfill, the company is fully committed to minimising any environmental impact from its business activities. Recycle bins are placed throughout the business, with all employees expected to recycle correctly. What happens to plastics that cannot be recycled? All plastics are recyclable. Some are not recycled because of the economic viability or the lack of facilities and infrastructure to do so. Charpak believes the UK needs to both create facilities to do this, and also create the value in the waste stream. That is why Charpak lobby hard to try to achieve this. Plastics that are not currently recycled are currently either land filled or incinerated (either in the UK or abroad). Charpak believe recycling is the most cost effective and sustainable means of saving future resources by reusing plastics again and again. What is Charpak plastic recycled into? The plastics are taken to a plastics re-processor for washing, cleaning, and re-manufacturing for reuse into more plastic packaging, or other plastic products. Is there such a thing as recycled PP? Yes – PP is recyclable. The UK does not yet have a standard in place to allow it to be recycled for food products. However it does go back into industrial use (for example Paint Containers and also Car Parts). If black can’t be recycled because it doesn’t show against the conveyors, couldn’t the colour of the conveyers be changed? There is a lack of funding for this and it is very costly. 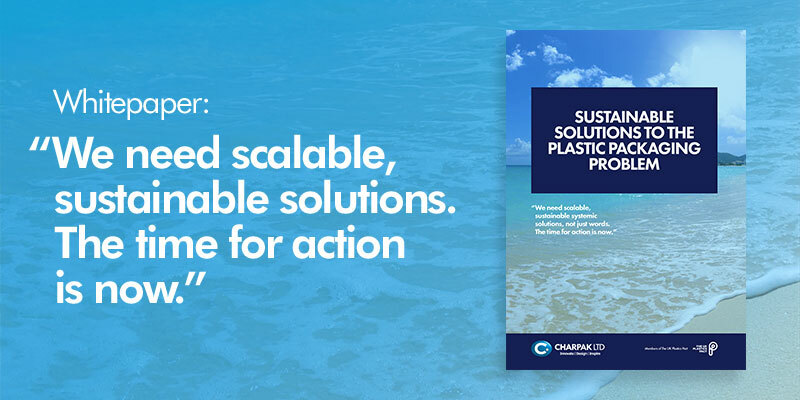 Charpak are working with stakeholders to ensure we have a system to deal with ALL black plastics and following feasibility trials solutions could be in place by end 2019. Are bags and films not recycled/recyclable? Most bags and films are recyclable. They can be re-manufactured into bags for life for example. Charpak do not manufacture bags and films. If so, can stiff plastic be recycled if a film is still attached to it or does it need to be fully removed? If the film is the same material as the packaging, yes they can be recycled together. The industry is working hard to ensure this is the case. Sometimes it will not be possible but the more new films can be developed the better it will become. To guarantee recycling of stiff plastic in household waste, the recommendation is always to separate the film from the stiff plastic and check your local recycling. These are only recyclable when the window is separated from the carton. Unfortunately, this does not happen very often. This type of packaging is therefore generally landfilled or incinerated. Charpak do not manufacture this type of packaging, and are actively making recommendations to clients on more sustainable options to ensure all the packaging is recyclable. Why aren’t takeaway plastic containers recyclable? Most takeaway plastic containers are recyclable and already contain recycled plastic. The Expanded Polystyrene (These are the “soft touch” squeezy ones that you get Burgers/Kebabs in) containers are not currently recycled and should not be used. If you want a circular economy, do you offer collection of waste facilities? No. 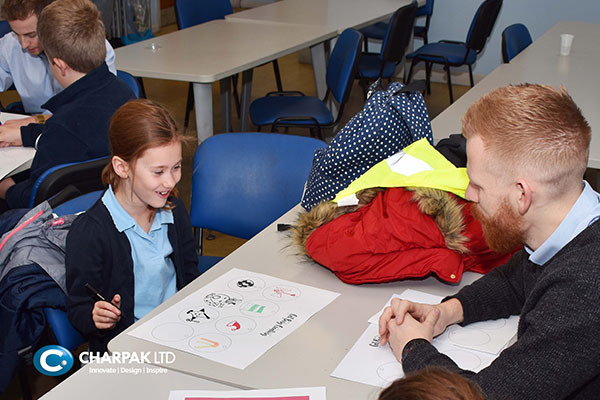 Charpak are working with in partnership with Cambridgeshire authorities, waste collectors, and a local re-processor to create a circular economy using plastics collected from homes, schools and businesses within Cambridgeshire to be recycled and reused by Charpak. Are metallic colour plastic trays recyclable? No – these types of plastic should be avoided. Any metal in plastic contaminates the material and should not be used. Gold, Silver and Bronze plastic packaging is recyclable because it does not contain metal. These coloured plastics are manufactured specifically for the food industry with a gloss/shiny finish and approved for food contact. All pantone references can be matched to a client’s brand and Pantone reference. This is a vast area and is awaiting an overall definition. On 28th May 2018 the European Commission published a document which clarifies the definition of single use plastics, and those which will be imminently banned. http://europa.eu/rapid/press-release_IP-18-3927_en.htm. Single-use plastics can range from water bottles to straws, plastic cutlery, takeaway boxes and can also include meat trays and bakery trays. Charpak advocates making sure all these products get recycled and reused, creating multi-use plastics so we recreate new from old. 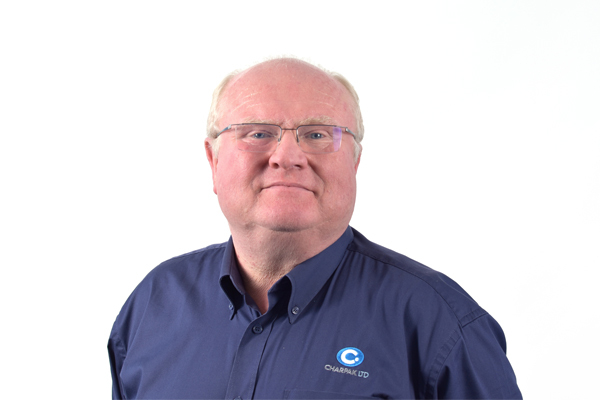 Are you developing any plastics in-house? Not currently. 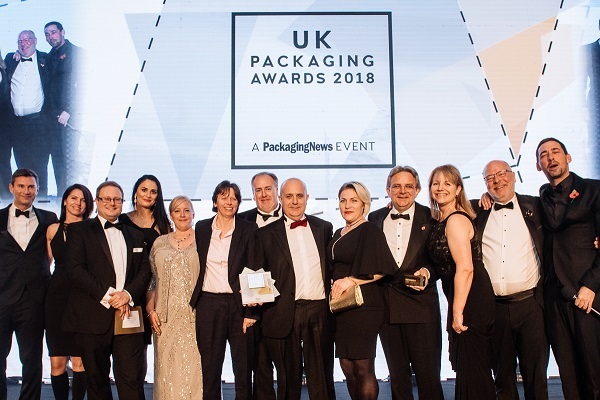 Charpak work with industry associations and Universities who have research programmes and materials scientists leading the way in science and engineering to ensure future plastics are more sustainable. The collective goal and objective is to drive forward change for continuous improvement on better designed, and more usable/reusable packs. What is the future for plastics? There will come a time when plastics are not made from fossil fuel products. Short to medium term however, it is more vital that we recycle and re-use what is already there, which means we save the earth’s resources and cause less damage in the process. Until there is a more natural resource to replace the many benefits we get from plastics, they will be here in some form. Are all plastics tested for Migration / Heavy metals? Yes. Charpak certifies all our products. Do you have Technical Data Sheets for plastic products? Are your plastic products suitable for food use? Yes, and we certify this for our customers. What is a functional barrier? Functional barriers are used to protect the food contained inside the pack. These can be for such reasons as UV blocking or for allowing gas escape of water barriers, and sometimes to allow gas in too. Do your Products contain PFCs or PFAs? What is the content of recycled material for recycled material? Charpak’s rPET contains up to 75% food grade recycled plastics. Charpak advocates moving to 90% content to reduce our reliance on fossil fuels. However we need to ensure that consumers recycle more to allow us to do this. Is there such a thing as 100% recycled material? Yes. However, this can generally only be recycled up to six times. Without some prime grade plastic the strength and flexibility would be reduced. Yes it can be frozen to -20 degrees. For blast freezing and temperatures to -40 degrees then there is a special grade available. Is there a difference between APET and RPET? No. APET however contains no recycled product whereas rPET designates that the plastic includes recycled plastic. Do your plastic products comply with REACH? Can all your plastic products be recycled? Do Charpak recycle all their plastic waste? Do you use any of the above in any of the acetates supplied to us… (Bisphenol A(BPA))? None of the Plastic products that Charpak process contain any BPA. This is an acronym for the chemical Bisphenol A. This is not used anywhere in any product that Charpak manufactures. Prescribed Industrial Waste or Post industrial waste. Are your cardboard items FSC certified? Are your materials FDA approved?